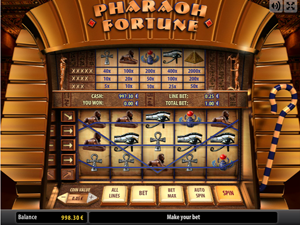 Pharaoh Fortune released by Gamescale is a very easy to play slot equipped with five reels and five paylines. The gameplay takes place on a single screen, with the paytable located above the reels set. Despite its simplicity, the slot features quality graphics, nicely designed Egypt-related symbols and a x2000 fixed jackpot. Pharaoh Fortune is a low-volatile game, therefore, you will see very frequent wins to keep you entertained for a long time. You are welcome to try the slot at no cost for you. The reels of Pharaoh Fortune look like being inserted inside a pharaoh’s headwear, and the slot itself is designed to resemble a mechanical machine, with its lever on the right side made in the form of a pharaoh’s striped warder. You may spin the reels by yourself pushing the Spin button every round, or you may opt to enable an autoplay feature, sit back, relax and watch the reels spinning automatically. To end the automatic session, just click Stop. In the slot, you will see only five themed symbols including a pyramid, the Eye of Horus, a scarab, a sphinx, and an ankh. Like most games produced by Gamescale, Pharaoh Fortune has no wilds, scatters and free spins, yet the gameplay is not at all boring because winning combinations display across paylines on an all too regular basis. When a winning combo lines up bringing you a win, you will see colorful jewels falling from top of the screen to celebrate your award casino canada online. the number of coins: 1 to 5. This option is tuned by clicking the Bet button. The betting system will appeal to players who are on a budget as the minimum bet starts at as low as $0.05, with all lines enabled, climbing up to $1.25 at its highest. The symbols award fairly decent wins. The second-largest jackpot of x400 times a bet is granted for five Eye of Horus symbols. The biggest prize worth x2000 is given for the Pyramid symbol if these five get lined up. The max line bet is $0.25, so the first jackpot amounts to $500, in a cash equivalent – well, it’s not bad for a five-payline slot. Pharaoh Fortune is a 5-reel slot machine with sleek graphics, Egypt-themed symbols and classic functionalities on offer. Being a low-volatility machine, it yields frequent payouts with the largest one reaching $500. All in all, Pharaoh Fortune is a perfect option for low-bettors and first-timers as you do not have to think over its paytable intricacies and other advanced features.